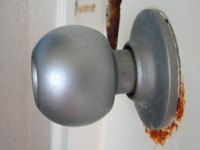 Door knobs are simple machines, until they refuse to function and become anything from a minor nuisance to an emergency. The technique for dismantling the knob will depend on the age of the knob in question. Knobs 20 years old or older may have concealed hardware that requires a plate be removed before the mounting screws can be accessed. Most newer knobs have mounting screws clearly visible on the baseplate near the knob spindle on the inside of the door. Use a screwdriver, rather than a power tool, when dismantling door knobs to prevent damage to the hardware. Locate the mounting screws. If they are clearly visible remove the screws with a screwdriver by twisting it in a counterclockwise direction. If the mounting screws are not visible follow the instructions following "Hidden Hardware." Pull the two halves of the doorknob from opposite sides to separate and remove them from the door. If the knob will be reinstalled, slide the halves of the knob together and thread the mounting screws into the knob for safekeeping. Remove the two screws in the plate on the edge of the door with a screwdriver to release the striker bolt. Pull the striker from the door edge. Locate the mounting screws. If they are not clearly visible on the inside baseplate near the knob spindle look for a small metal tab protruding from one side of the knob spindle. Press the tip of a flat bladed screwdriver firmly against this tab and pull out on the knob to remove it from the door. Look along the outside edge of the baseplate for a second small metal tab. These are typically 1/4 inch or less across and protrude about 1/16 of an inch from the side of the baseplate near the door's face. Press the tip of a flat-blade screwdriver into this tab to release the plate and reveal the screws. Remove the screws from the baseplate according to the instructions for knobs with visible hardware. Pull the second half of the knob from the door and remove the striker from the door's edge..